← CPR: Are You Ready For The Moment You Can Make A Difference? Posted on September 6, 2012, in Uncategorized and tagged family, traditions. Bookmark the permalink. 11 Comments. When our kids were young we used to go on annual camping trips which everyone looked forward to planning – and doing. Then when they got older I took each kid on an annual one-on-one backpacking weekend in the Sierras Since is was just the one kid and dad there was no competition but really good quality time. Now they each have their own kids and I expect they’ll do something similar when they get old enough. Those trips sound fun, David. I especially like the 1 on 1 trips as they got older. Great idea that I’m sure was very special to them! My family’s tradition is that – no matter how late it is – we always sit down as a family to eat our dinner together. Hard to pull off sometimes but well worth it. Game night use to include the tried-&-true-old ones like “CLUE” and TRIVIAL PURSUIT” in addition to strategy ones like Milleborne and Chess. Also Poker when we wanted to throw some wagering into the mix! We always have a 4th of July BBQ and pool party. Tuesday nights are “Family Dinner Night. 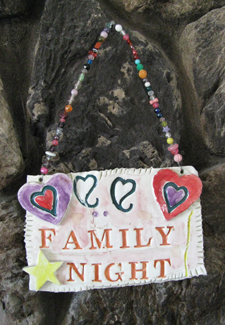 Now, families should always get together every day for a meal, but Tuesday nights we get together with extended family. Our family unit has dwindled, the kids are all out, on their own. When we do get together, there’s usually a huge card game, or trivial pursuit game going. Liverpool Rummy is a riot. Our family traditions are more around the holidays. We go to church and visit old friends & extended family as the whole crowd.